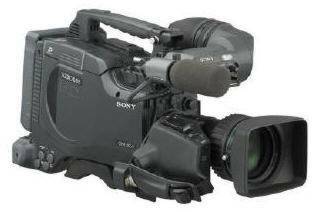 24 years of Sony broadcast and production camcorders, there’s never been anything like the PDW-F350. Here’s the high definition camcorder with a size, weight and price that are easy to handle.Here’s an indie film camcorder with true 24P, plus overcranking and undercranking. Here’s a production camcorder, with time lapse, slow shutter and SD/HD switchable recording. And the PDW-F350 is a news camcorder, with the rugged, shock-resistant construction you can take to extremes. And that’s just for starters. Thanks to XDCAM Professional Disc™ recording, you also benefit from rugged, removable, media that costs under $30 (MSRP) for over 120 minutes of HD recording. You capture video as MXF data files. You can edit proxy A/V right on your laptop. And you can transfer footage via FTP on any data network. The PDW-F350 is good news for anyone who’s been using Betacam® SP recording and looking for the right digital upgrade. And for anyone who’s been using the DVCAM™ system and looking for the best transition to HD. In fact, for anyone who’s been waiting for the right high definition camcorder, the PDW-F350 is a signal. The product is right. The format is right. The time is now.